LEED Neighborhood Development Wants You to Build More More More: Why doesn’t LEED-ND certify already existing neighborhoods? It’s one more example of green consumerism, or, as I like to call it, eco-narcissism. Uncovering The Militarized City: D.C. is the strongest example of a national trend. Urban space is increasingly being reshaped to serve the ends of security: guards, gates, guns, cameras, cops, and so on. Fares and Fairness: A long look at the economic and philosophic justifications for how high subway fares actually ought to be. Symbols Matter: Fairfax City or Fairfax County: An urbanizing county outside D.C. is considering becoming a city. I argue that looking at just the policy outcomes-transportation and taxes-misses the much more important symbolic weight of choosing to call yourself a city. World’s Fair 2010: “Better Cities, Better Lives”: The Shanghai 2010 World Exposition is on the theme “Better Cities, Better Lives.” A brief history of the importance of World’s Fairs in urban design. Urban Renewal By Any Other Name: Why the vogue for “shrinking cities” is just the same old argument for urban renewal. And we know how that ends. Gender and the Art of Bicycle Maintenance: Why are there three times more male bikers in New York than female bikers and what can we do about it? 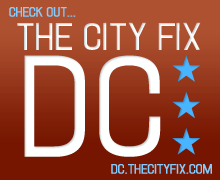 If you’ve made it this far down, really, just bookmark dc.thecityfix.com or add it to your RSS reader.